PACIFIC OCEAN - The guided-missile destroyer USS Michael Murphy (DDG 112) and French frigate FNS Vendemiaire conducted a passing exercise (PASSEX), Jan. 29. During the PASSEX the ships operated in close proximity to one another. The exercise strengthened Sailors' knowledge and practical application in shiphandling and navigation. 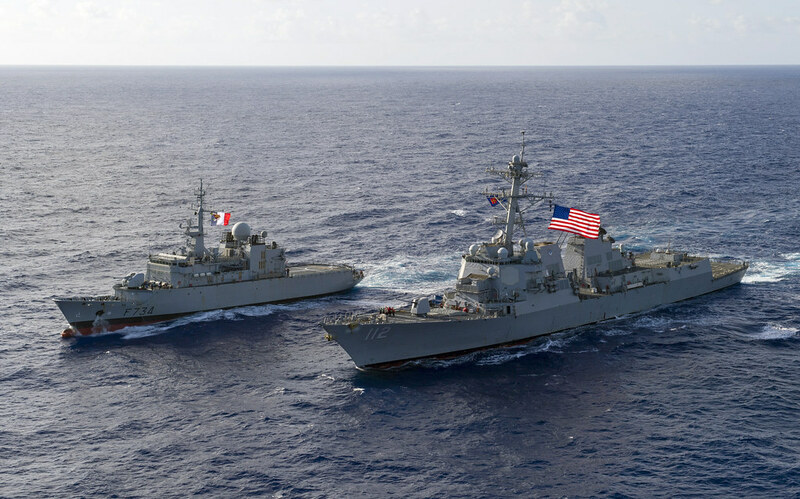 "This exercise was a unique opportunity for Michael Murphy to conduct training with the French Navy and practice shiphandling and warfighting skills," said Cmdr. Kevin Louis, commanding officer of Michael Murphy. "Working together furthers our mutual ability to operate and see what can be learned from each other." A PASSEX is unique because it allows navies to provide crews with real-life situations to practice everyday watchstanding and communication skills with foreign vessels. During Michael Murphy's exercise with the French ship, Sailors practiced communication and shiphandling techniques. Michael Murphy was commissioned in 2012 and is named after U.S. Navy SEAL Lt. Michael P. Murphy. Murphy was posthumously awarded the Medal of Honor for his heroic actions during Operation Red Wings in Afghanistan, June 28, 2005. He was the first person to be awarded the medal for actions in Afghanistan and was the first member of the U.S. Navy to receive the award since the Vietnam War.